World number 41 Benoit Paire will be the star attraction in the qualifiers of the Tata Open Maharashtra tennis tournament to be held here on December 30 - 31. The Frenchman will be joined by Spanish world number 164 Tommy Robredo for the race to grab the four spots in the main draw to be held from January 1 - 6. The ATP 250 World Tour series will played at the Balewadi Stadium here. Paire, the 2015 ATP Comeback Player of the Year, has made five appearances in the Indian ATP event. The Frenchman reached the semi - finals of this marquee event thrice - - in 2017, 2016 and 2012. Spaniard Robredo will be coming back to India after a 14 - year gap. In 2004, he lost a nail - biting semi - final to Paradorn Srichaphan of Thailand while in 2002 he lost in the last - four stage to Russian Andrei Stoliarov. 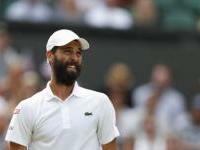 Paire earned his career's biggest win this year when he beat Swiss star Stan Wawrinka in the second round of the ATP Masters 1000 in Madrid. Interestingly, playing alongside the Swiss player, Paire had also won the 2013 Chennai Open doubles title, a feat he couldn't repeat in the 2016 edition pairing with Austin Krajicek. After withdrawing from last season's event due to an injury, Robredo will make the main draw exciting if he gets through the qualifiers. The Spanish pro had won the Chennai Open doubles title alongside Rafael Nadal way back in 2004. He also won an ATP Masters 1000 doubles event in Monaco alongside Nadal in 2008, beating the pair of Mark Knowles and Mahesh Bhupathi. Another name to watch out for in this tournament will be world number 110 Marco Cecchinato. The Italian, who lost his qualifying match to India's Yuki Bhambri last year, will look to better his record here. World number 127 Adrian Menendez - Maceiras, world number 186 Carlos Taberner and world number 199 Ricardo Ojeda Lara will be three other Spanish players along with Robredo in the qualifiers.